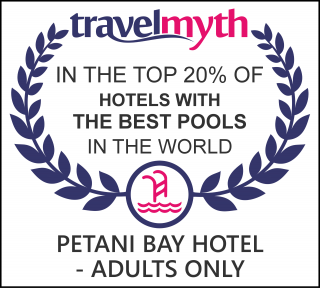 Welcome to Petani Bay Hotel, α unique adults only hotel, located at the Western part of Kefalonia, overlooking the Ionian Sea, off the beaten tourist track. Ideal for the exquisite traveler who is looking for serenity along with remarkable views, sunsets, and above all comfort, space and privacy. For those who want to sleep at night and taste fresh salt air and soft summer breezes while waking up in the morning by listening to goat bells. Our mission, however, still remains: that is, “enjoy & dream at Petani Bay Hotel”. Our decision for a child free environment guarantees for privacy, relaxation, comfort and elegance in the most romantic part in Kefalonia. At Petani Bay Hotel, Voula and her staff offer its guests concierge services to assist them in planning their vacation in Kefalonia, providing tips and information about the island and the local attractions as well as suggestions for excursions and dining options with great joy. Besides luxurious accommodation, the hotel provides a pool bar and an award winning infinity pool, all overlooking the incredible Petani Bay. In addition, open spaces in two levels, one at the infinity pool which has a breathtaking view over the bay and wooden decking which encloses the area, continuing to add to the calming effect of the surroundings. Furthermore, the gardens are full of numerous flowers and trees and there is even a ‘fairy trail’ through the olive trees at the rear of the hotel, with quaint wooden stepping stones guiding your way back to the private parking lot. Our mission is to provide “the environment” for complete relaxation, enjoyment and vivid memories. Let us accompany you to a unique and unforgettable journey to Simplicity, Natural Beauty and Inspiration. A hotel that suits the tastes of demanding guests at reasonable and affordable prices. Enjoy and dream with the breathtaking views and sunsets of the Ionian Sea. Located above Petani Beach, which has been voted as one of the top 10 rated beaches on all Greece along with Myrtos beach. Petani Bay Hotel offers amazing panoramic views of the Ionian Sea. We are waiting for you and offer you a peaceful and memorable holidays. *** Rates include all taxes except overnight accommodation tax ( 3 Euro per room, per night) which is payable upon arrival at the hotel.